Welcome to this week’s edition of Jaime’s Lazy Late Night Cooking Corner, the show where I whip up last-minute single serve microwave treats every Thursday while wearing my robe. 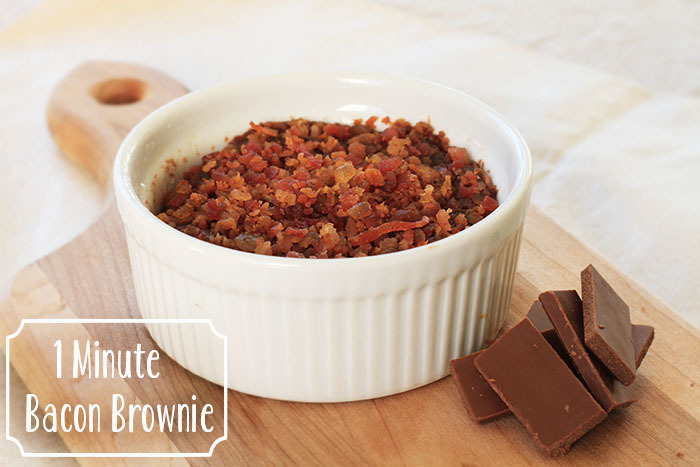 Today we are combining two of our favorite foods, brownies and BACON to make a one-minute bacon mug brownie. So salty, so sweet, so mmmmmeaty. Melt butter in your ramekin or mug for 20 seconds in the microwave. Add wet ingredients to melted butter (water, oil, vanilla) and mix together. In a measuring cup combine dry ingredients (flour, sugar, cocoa powder, salt, baking powder) and whisk together. Pour wet ingredients into dry and mix together. Pour back into serving dish. Sprinkle bacon bits on top. Microwave for one minute and check. If not quite done microwave in ten second increments until it’s no longer runny. This looks like great comfort food. Where do you find the inspiration for your microwave recipes? MMM…wow. Chocolate and bacon combined just looks too good. Can’t wait to try this yummy recipe. And the fact that I can use a microwave is very exciting. I loved the sound of this recipe so much, I featured it on my own blog today. It sounds so good! Do you think you could create a single serve pumpkin pie recipe in the microwave? I tried your cheesecake and it was crazy good. Tried a pumpkin variation but it was a disaster.